I routinely treat children and adolescents who have problems with behavior and learning, and I treat over a hundred common causes for these youth problems. Want to be shocked? The most common cause for their problems is indoor mold contamination. This problem, often called Sick School Syndrome or Sick Building Syndrome (SBS), is caused by water leaks and excessive humidity inside a sealed building. Until recently, few physicians had any understanding of SBS. Few understood that mold toxins from Sick Schools and Buildings can undermine child health, learning and behavior. The recent EPA-funded study1 Guidance for Clinicians on the Recognition and Management of Health Effects Related to Mold Exposure and Moisture Indoors has started to turn a few physicians around. The study advises medical clinicians to be on the lookout for neurological affects from indoor mold. Now a few pediatricians and allergists are starting to recommend mold testing to confirm indoor mold exposure, followed by a "prescription" for mold remediation as part of a cure. But most physicians still don't get it. Most have not read this important EPA-funded study and other recent research showing mold as a common cause of illness. New breakthroughs in scientific techniques are quickly changing the face of medicine–including the field of mold-related illnesses. But most sincere physicians are just not able to keep up. Fortunately, we can help. 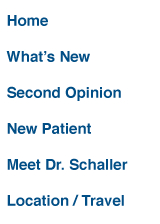 We are specialists in the field of mold toxins and their impact on human health. In this second edition of When Traditional Medicine Fails, we include critical new information to help you and your physician cure mold related ailments. Just a few years ago, no one had access to powerful DNA profiling technology, which became a household term during the O.J. Simpson case when it was used to profile human DNA. Now DNA profiling is used to characterize mold growth both in sick buildings and sick people. Its use and development was funded by the United States EPA. This U.S. study was repeated in the U.K. and had the same results. Unfortunately for you and your loved ones, traditional medicine often does not keep up with the latest technology. Most physicians do not know about DNA profiling for mold or how to use it to help you. In a similar fashion, new breakthroughs by numerous medical research groups in the United States and Europe show that many neurological symptoms are a direct result of "breathing" toxins produced by the same toxin-producing molds found in Sick Buildings. In Chapter 3, we discuss the latest report published by the U.S. Surgeon General on recently declassified Army research revealing that mold neurotoxins have been used in biowarfare. The research includes studies on human subjects showing that neurological disorders from exposures to mold biowarfare agents correlate with neurological disorders from Sick Buildings. U.S. Army research also discusses toxin-binding treatments to cure neurotoxin exposure. These treatments are very much in line with the treatments developed by Ritchie Shoemaker, a prolific physician, and Kenneth Hudnell, an EPA scientist. Toxin-binding treatments are discussed further in Chapter 12. We recommend that you review the 2004 publication by the National Academy of Science, Damp Indoor Spaces, starting with the section on Neurotoxic Affects of Mold on page 157. Neurotoxic mycotoxins tend to fall into three general classes: tremor-genic toxins, paralytic toxins, and toxins that interfere with neurotransmitters or receptors either centrally or at the target organ. While mold toxins cause dozens of common problems to the brain beyond these three basic categories, the quote confirms that indoor mold can cause much more than a runny nose. Unlike typical bacterial and viral infections, mold toxins harm a very wide range of body functions and can make the diagnosis a bit tricky to the untrained eye. Some people come to me (Schaller) after months or even years of traditional allergy testing, child psychiatry or pediatric drug treatments, yeast-free diets, gluten-free diets, fad diets for this and that, brain scans, numerous psychological and neurological tests, blood tests, and urine tests ... none of them helped! Routinely, because of a lack of knowledge, sincere parents, teachers, schools, aunts, uncles, grandparents, clergy, pediatricians, and counselors will miss SBS as a cause for numerous youth troubles including both learning and behavioral problems. They simply do not know the impact that indoor mold can have on youth health. This book unravels the mysteries of mold biotoxin illness, and will guide you and your child to a path of recovery. That the billions of dollars being spent on prescription drugs to treat illnesses from Sick Buildings NEVER WILL BE effective. Traditional drug therapies only treat the symptoms and do not cure. These make drug companies rich, but keep your child sick. When children suffer from multiple symptoms involving several organ groups, and when traditional medical testing does not find the problem, biotoxin exposure from indoor mold growth is often the source of the illness. While the symptoms can seem somewhat mysterious to the untrained, mold biotoxin illness can be treated successfully. Do You See Andrew's Problem? Andrew transferred to a respected private school. At the beginning of the school year, he had trouble following directions and had an "ill mood" according to his strict teacher. His parents also noticed that Andrew seemed to be moodier. He was complaining that the classroom was "too loud" and he seemed to exaggerate physical contact with siblings and friends. His sleep was restless. Andrew wanted to have more time with his mother and to sleep in his parent's bed (even though he had stopped this behavior three years ago). He was found to have both depressed alpha MSH, a critical hormone with over twenty functions, and increased blood inflammation (high MMP-9 and C3a). Plus, DNA studies showed that his genetic make-up included a vulnerability to mold toxins. Furthermore, his school had documented mold problems. All these indicators strongly pointed toward mold toxins as the cause of illness. After he was removed from the moldy school and given treatment for mold toxins, Andrew started getting better immediately. He was home schooled for 6 weeks and now is in a new school. Leaving the school certainly was an extreme solution and is not always needed. But after his mother tested two of the school's fan blades and the school's crusty, old AC filters, she found high levels of illness-promoting mold–not just the routine molds usually found indoors. She insisted on a new, mold-free school. The parents spoke with their pediatrician and allergist about the mold sampling results along with the blood test findings from our lab. They also discussed Andrew's improvements. The pediatrician and allergist apparently had no real reply. These physicians had no idea what any of these tests meant. They admitted that they had neither read any of the latest research on the treatment of mold-related illnesses nor been trained in this type of illness. But what is important is that Andrew is improving�his behavior is returning to normal. I just saw a picture of him, and he was clearly happy in the photo. Good for him and his loving sacrificial parents! In the outdoors, there are tens of thousands of competing species of mold. Living outdoors is tough for molds. Most can barely survive outdoors with the thousands of competitors, UV radiation, rain, temperature fluctuations, and wind. A home or school with a moist indoors offers molds a much easier life. And as a result, when living indoors, their ability to make biotoxins, which they use to kill other molds and bacteria, is greatly enhanced. Low levels of indoor mold growth can adversely affect sensitive children. Today's common household materials such as wallboard, carpet and wood–along with today's tighter, more energy-efficient buildings that keep out fresh, outside air–are what most toxin-producing molds thrive on. Just add water. After two to three days, a wet indoor setting can start producing mold. Once the mold starts, it will continue to grow with only humidity. Mold spreads fast, and the biotoxins they produce to kill other molds and bacteria can make people ill. Initially, most people are entirely clueless that they are being affected. Sickness can come on gradually as mold biotoxins pass from cell to cell with great ease–altering DNA and hurting children and their parents. Do you think mold problems are rare? The EPA reports that 30% of all U.S. structures have indoor mold. And how often do you hear of a roof leak in a home or a school? I routinely hear of homes or offices having a "small leak" or a "little water in the basement." People calmly mention an annoying little leak, and talk about having a plumber come "in a few days." They mention this "leak" casually. But indoor mold is not a casual topic. Every year one in ten homes has an indoor leak. And every year, schools turn off their air conditioning during August, inadvertently creating a highly humid and stale indoor environment that is perfect for mold growth. Hidden mold growth in water-damaged schools and in homes is a major child issue. 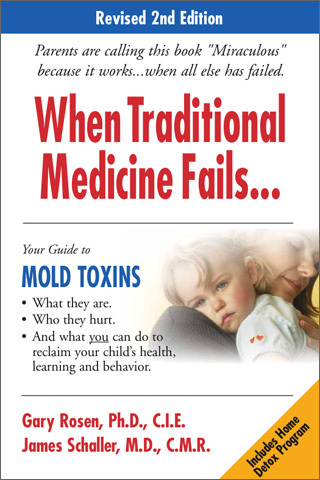 With these facts in mind, I am delighted to introduce When Traditional Medicine Fails: Your Guide to Mold Toxins ... a new weapon to protect the children you love. Diagnosis: We fully and clearly explain mold toxin symptoms and explain which children are most likely to become ill from mold. Specifically, we offer material and cases showing how mold toxins affect behavior, insight, mood, concentration, memory, personality, and achievement. You won't find this material anywhere else. Mold Clean-Up: We show you the proper way to remove mold and mold toxins from both homes and schools. Curing your child includes carefully removing mold and toxins without further contaminating the building. We explain how you can make your home "as good as new." Ongoing Healthy Environment: Humidity control and air filtration are powerful tools to continually eliminate from indoor air even trace amounts of not only mold spores and their toxins, but also bacteria, viruses, and other pollutants. We explain in detail what you need to know to provide a healthy indoor environment for your children and entire family. Treatment Options: We offer many specific ways to restore your child to full health, including the use of mold toxin binders to cure mold toxin exposure before it seriously alters your child's body chemistry. You will be given many tools and options to obtain the best treatment for your child. I am deeply honored to co-author this expanded and fully revised version with Dr. Rosen. I think you will find it a mix of clear writing, cutting-edge medicine, and practical advice on how to fix mold-related problems. We feel this short book is the simplest and fastest way to reclaim your child's life from environmental illness caused by indoor mold growth. The next few pages depict several sample images of common toxin-producing molds, along with descriptions of just some of their adverse effects on human health.